Being the first modification I created for FTL that isn't complete garbage, I figured someone else might want to see what little I have to offer. 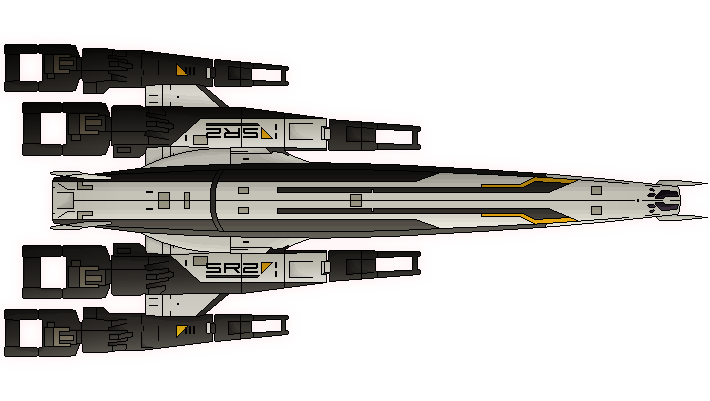 The Normandy SR2 from Mass Effect, whose story many already know. Constructed by Cerberus after the destruction of the original Normandy, it is a stealth frigate, which is why I decided to replace the Stealth Cruiser A. My decision to create this mod arose due to the lack of any other decent Mass Effect ship mods. I felt that FTL was quite similar to the Mass Effect universe in its nature, and that various Mass Effect ships would fit well with FTL's style. Features my typical lazy shading and gibs, and not-so-lazy vanilla FTL style cloaking images. I'm not completely satisfied with how the lighting came out, but then again, that is where my skills are most lacking. The defining feature of the SR2 Normandy is its Javelin Torpedo launchers. One takes two power, and fires one missile that deals 2 damage with a good chance of breach. The rest of the craft is weak by comparison, but the Javelins alone can easily shatter most enemy ships, if the Normandy has the missiles to do so, and does not take a hit to the weapons bay in the process. Note: Due to an issue with rooms that are 3 spaces long or wide, the low-oxygen warning bars will only cover part of the room. For this reason, I recommend the Low O2 Icons mod by 5thHorseman. I'm just waiting until this gets more content, then I'm downloading this sucker! The poor normandy looks a bit thin, but I'm still sitting here wishing I could make a cool looking ship for this game.